Power outages in North Carolina have increased as a weakened and slower Hurricane Florence moves closer to the coast. The two major electric utilities covering the state —Duke Energy and Dominion— and a consortium of electric cooperatives reported more than 80,000 customers without power as of early Thursday evening. That doesn’t include numbers from dozens of city-operated electricity providers. North Carolina Gov. Roy Cooper says there are over 12,000 people in 126 shelters as the first effects of Hurricane Florence begin to batter the state. Cooper spoke at a news conference Thursday afternoon with state emergency management officials. The governor said tens of thousands are without power and roads are beginning to flood along the coast. Cooper says officials are also in the process of opening more shelters because demand is expected to continue to increase. Virginia Gov. Ralph Northam says residents should shelter in place and stay off the roads as Hurricane Florence starts to come ashore in the Carolinas and its effects make their way north. Northam spoke at a news conference Thursday with emergency management officials. He says parts of Virginia will likely see tropical storm-force winds, flooding and several inches (centimeters) of rain. He notes that forecasts for the weekend show a continued threat to southwest Virginia as the storm is expected to make a gradual northerly turn. Jeff Stern is the state’s coordinator of emergency management. He says there are nearly 400 people in shelters across the state. A flight-tracking service says airlines have canceled more than 1,500 flights through Saturday. FlightAware says that was the number as of Thursday evening. At least 140 flights were canceled Thursday in both Charlotte and Raleigh-Durham, North Carolina, although that amounted to only around 8 percent of flights at the sprawling Charlotte airport. Several airports along the coast were virtually shut down. South Carolina’s most popular tourist destination is like a ghost town. North Myrtle Beach was nearly empty Thursday as the first bands of heavy rain from Hurricane Florence approached. A few locals briefly walked into the sand but were quickly sandblasted back by stiff winds. One man tried to skimboard, but gave up after a few minutes as winds from the land cut down the waves. He called the ocean “Lake Myrtle” as he walked back to his car. There was several hundred feet (meters) of sand between the dunes and ocean as a low tide approached around 5 p.m. Thursday. The sky occasionally spit a drop or two of rain, but the steady rain bands remained to the north. 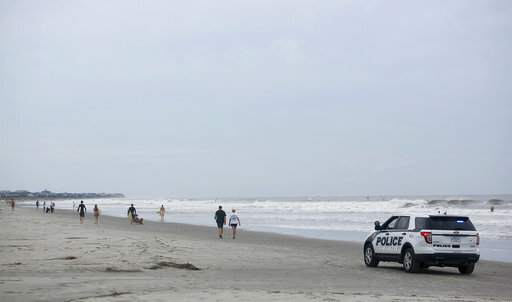 A police officer sat nearby to talk to anyone who ventured too close to the surf. The area called the Grand Strand attracts 18 million visitors a year. On Thursday, every restaurant, beachwear shop and mini golf course was closed. Hurricane Florence is gradually slowing and weakening as its eye nears land. 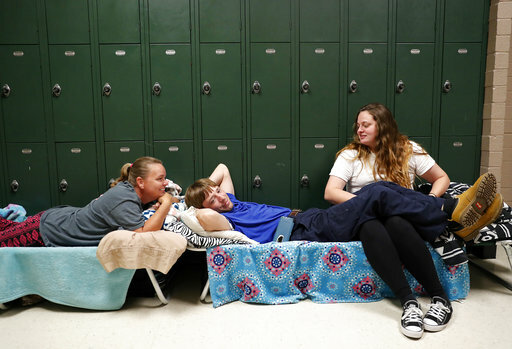 As of 5 p.m. Thursday, the Category 2 storm was centered about 100 miles (160 kilometers) east-southeast of Wilmington, North Carolina, and about 155 miles (250 kilometers) east of Myrtle Beach, South Carolina. Its forward movement was 5 mph (7 kph) and top sustained winds stayed at 100 mph (155 kph). Florence’s outer bands of wind and rain began lashing North Carolina on Thursday. Its center will approach the coast later Thursday and make landfall around the North Carolina-South Carolina line. Forecasters at the National Hurricane Center say the storm will weaken after landfall but also linger, dumping heavy rains for days. Florence’s hurricane-force winds were blowing 80 miles (130 kilometers) from its center, and tropical-storm-force winds reached up to 195 miles (315 kilometers) from the eye. Ryan Maue of weather-tracking site weathermodels.com says the European climate model is predicting that Florence will dump more than 2 feet (60 centimeters) of rain in parts of North and South Carolina. Measured another way, the same model predicts 2 trillion to 11 trillion gallons (7.5 trillion to 41 trillion liters) of rain will fall in the Carolinas over the next week. The National Hurricane Center says Florence could dump 20 to 30 inches (50 to 75 centimeters) of rain, with some places getting as much as 40 inches (1 meter). Forecasters from the center are predicting a storm surge of 7 to 11 feet (2 to 3 meters) in the area from Cape Fear to Cape Lookout, North Carolina, with some higher amounts possible in the Neuse, Pamlico, Pungo and Bay rivers. They’re estimating a storm surge of 2 to 4 feet (60 centimeters to 1 meter) from Edisto Beach to the South Santee River in South Carolina, and 6 to 9 feet (2 to 3 meters) from Cape Lookout to the Ocracoke Inlet in North Carolina. Hurricane Florence has become an issue in a North Carolina congressional race. As 9th District Democratic candidate Dan McCready announced he was suspending his campaign during the storm, The Charlotte Observer reports Republican rival Mark Harris has bought more local cable television ad time on The Weather Channel to run in the coming days. Harris, McCready and Libertarian Jeff Scott are running for the seat currently held by Robert Pittenger, who lost in the GOP primary to Harris. Airbnb says its hosts will offer free lodging to Hurricane Florence evacuees and emergency relief workers through Oct. 1. The home-sharing company said in a news release Thursday that more than 400 hosts are participating so far in the cities of Atlanta and Augusta, Georgia; Charlotte and Greensboro, North Carolina; Columbia, Greenville and Spartanburg, South Carolina; and Charlottesville, Virginia. Airbnb says evacuees or emergency workers can sign into its app and will see a tab directing them to free shelter. They are asked to click a box confirming they have been affected by the storm. Airbnb says it will also waive its booking fees for those guests. 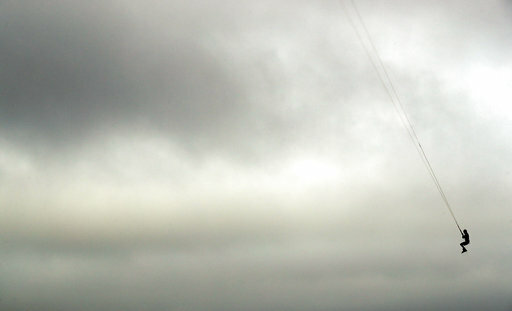 Airbnb hosts have offered free stays before, starting with Hurricane Sandy in 2012. More than 700 people also hosted evacuees and rescue workers during Hurricane Harvey last year. As Hurricane Florence begins to batter North Carolina, the state’s governor has asked President Donald Trump for another federal disaster declaration beyond what the president declared earlier this week. Gov. Roy Cooper requested the added disaster declaration Thursday because he anticipates what his office calls “historic major damage” across the state from the hurricane. Cooper’s office says the current emergency declaration is helping state officials prepare for the storm. It says the additional declaration would bring more federal help with debris removal, search and rescue teams, meals and generators, among other items. Cooper is seeking the new declaration so that federal funds and other assistance can be received as soon as possible. 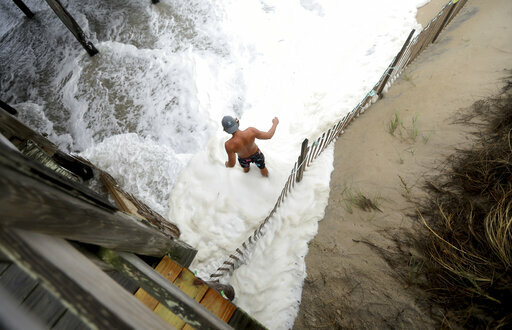 The approach of Hurricane Florence has given one South Carolina beach community a sort of split personality — businesses closed and boarded up while surfers flock to the beach to take advantage of storm-churned waves. 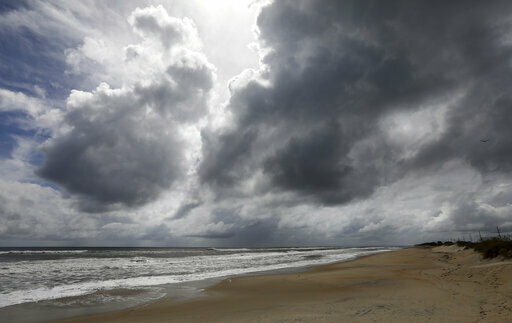 Molly Reagan strolled in the sand Thursday on Sullivan’s Island after leaving her office job early. She said she was one of the only people who showed up for work. 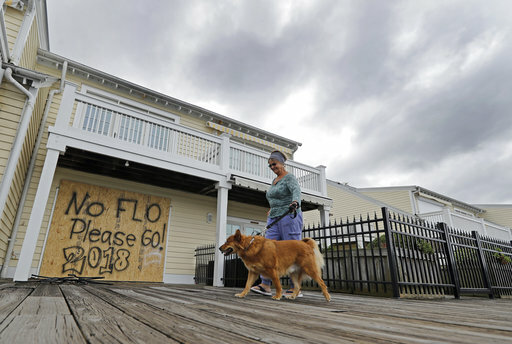 Many had heeded evacuation orders that included the island just east of Charleston. South Carolina officials say more than 400,000 people have evacuated the state’s coast and more than 4,000 people have taken refuge in shelters as Hurricane Florence approaches. State Transportation Department Secretary Christy Hall said Thursday that an estimated 421,000 residents had left the coast. Acting Department of Social Services Director Joan Meacham says shelters are about 12 percent full with the 4,000 residents. Meacham says the state can house more than 35,000 people if needed. She says 61 shelters have opened thus far, including 12 that are specially outfitted to help people with special medical needs. Gov. Henry McMaster has ordered the evacuation of most of the state’s coastline as the storm approaches. Officials say Hurricane Florence could bring not only flooding but also landslides to South Carolina. The National Weather Service is forecasting “significant” river flooding, especially in the northeastern portion of the state. That same area experienced dangerous flooding after Hurricane Matthew in 2016. Gov. Henry McMaster told reporters Thursday that up to 7 inches (18 centimeters) of rain in the state’s northwestern mountains could mean landslides and dangerous conditions. McMaster has ordered evacuations along much of the state’s coast. He warned residents to be prepared to be without electricity “for a long time” in the storm’s aftermath. The outer bands of Hurricane Florence have begun to impact the coast of North Carolina. Two amphibious Navy ships are on standby to respond and provide disaster relief after Hurricane Florence moves through. Navy Lt. Jamie Seibel said Thursday that the amphibious assault ship USS Kearsarge and the amphibious transport ship USS Arlington are the two ships that have been tapped to respond. Seibel says about 800 Marines from the 22nd Marine Expeditionary Unit are aboard the two ships, which will move directly to where they are needed once the storm passes. Seibel said the ships already have the resources and supplies they need, including a fleet surgical team, engineers and damage assessment personnel, as well as heavy- and medium-lift helicopters, search-and-rescue aircraft and smaller ship-to-shore landing craft. National Hurricane Center Director Ken Graham says hurricane-force winds are starting to get really close to shore as Florence slowly nears the Carolinas. Television footage Thursday afternoon showed water in a street at knee level due to storm surge in New Bern, North Carolina. Graham says that because so much water is being pushed ashore by Florence, rivers and inlets that normally flow out to sea will be forced to flow in the opposite direction. Storm surge also could push several miles (kilometers) inland. 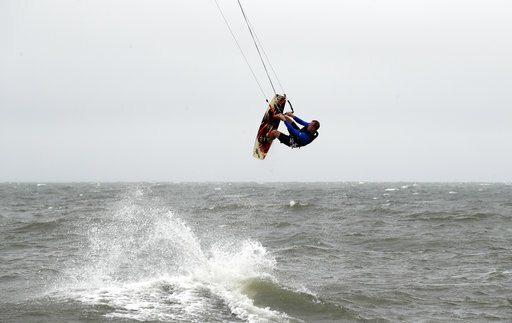 Power outages already are creeping up along the North Carolina coast as tropical storm-force winds started sweeping over land. Electric utilities and cooperatives reported about 12,000 outages statewide as of early Thursday afternoon, with nearly all of them at the coast. Most of the homes and businesses without electricity are in Carteret and Craven counties. Both are north of the eye’s projected path and expected to get massive amounts of rain— potentially 20 inches (50 centimeters) or more. Duke Energy is the largest of the utilities in the Carolinas. The company predicts Carolinas power outages caused by Florence will range from 1 million to 3 million customers. It’s got more than 20,000 workers from the Carolinas and other states in place to restore power. Duke reported few South Carolina outages Thursday afternoon. The only route off North Carolina’s Hatteras Island has closed as Hurricane Florence approaches. Officials with the state Transportation Department said Thursday afternoon that N.C. Highway 12 was closed in both directions on Hatteras Island, part of the Outer Banks. The closure means that people who chose to ride out the storm now officially have no way off the island. The two-lane highway is the only route to the mainland other than ferries. Forecasters say Hurricane Florence won’t change much before its eye makes landfall. 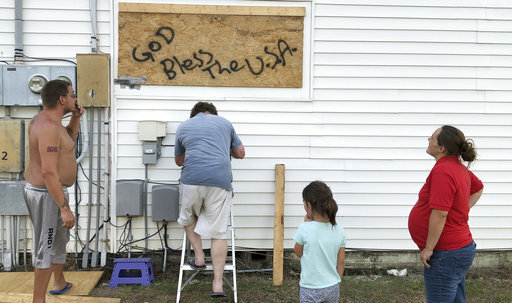 As of 2 p.m. Thursday, the Category 2 storm was centered about 110 miles (180 kilometers) east-southeast of Wilmington, North Carolina, and about 165 miles (270 kilometers) east of Myrtle Beach, South Carolina. Its forward movement was 10 mph (17 kph) and top sustained winds stayed at 105 mph (165 kph). An emergency management official in one of the most populated areas of coastal North Carolina says winds from the storm have already arrived and other impacts won’t be far behind. New Hanover County Emergency Management Director Steven Still said Thursday that residents who didn’t evacuate should expect 60 mph (97 kph) winds by 7 p.m. that would eventually increase to 100 mph (161 kph) or more. Still says landfall is expected around 8 a.m. Friday in the Wrightsville Beach area, and he said the area could see 20 to 30 inches (50 to 75 cms) of rain and beaches could get 9 to 10 to feet (about 3m) of storm surge. Wrightsville Beach Mayor William Blair says evacuations are complete. The head of Duke Energy Corp.’s North Carolina operations says it could take weeks to restore electricity if the company’s prediction that 1 million to 3 million of its 4 million customers lose power due to Hurricane Florence. Duke Energy executive David Fountain said Thursday that flooding from the slow-moving Florence must recede before crews can start sizing up needed repairs. He says based on the experience with Hurricane Matthew two years ago, it could be days before assessments start and the major electricity provider in the Carolinas can estimate when power can be restored. Fountain says outages in the worst-hit areas could last for weeks. He says repair crews will go where they can do the most good and won’t prioritize Duke Energy customers over the electric cooperatives and municipal utilities that buy and resell power. A flight-tracking service says about 1,200 U.S. airline flights scheduled for Thursday or Friday have been canceled, with some airports in the Carolinas essentially shut down. FlightAware said in its midday report Thursday that the number of canceled flights is relatively small and could increase. However, the hurricane’s effect on the nationwide air-travel system will be less than feared if, as now forecast, Florence veers away from the American Airlines hub airport in Charlotte, North Carolina, and doesn’t score a direct hit on Delta Air Lines’ massive hub in Atlanta. Meteorologists are saying Hurricane Florence is going to cause damage that exceeds $10 billion and could reach as much as $50 billion. Weather Underground meteorology director Jeff Masters said Thursday that rainfall flooding will cause at least $6 billion, storm surge another $3 billion, and wind damage about $1 billion. He says the $10 billion mark is based on Hurricane Matthew a couple years ago, and is just a starting point. Accuweather founder Joel Myers is estimating $50 billion to $60 billion in damage. One of South Carolina’s major power companies is warning customers to be wary of fallen power lines and other hazards that could come after Hurricane Florence’s arrival. South Carolina Electric & Gas Co. CEO Keller Kissam gave updates to reporters Thursday in a news conference at the company’s headquarters in Cayce (KAY-cee). Kissam says the storm, which is expected to bring torrential rains and sustained winds, could mean that it takes linemen longer to repair any power problems, in part due to concerns for their own safety. Kissam says SCE&G has been in touch with other power companies in the Southeast that are willing to help with any problems after the storm. Kissam says crews are already in South Carolina from other states, including Mississippi. SCE&G has more than 700,000 power customers in South Carolina. The Virginia National Guard says 1,200 personnel are staged and ready to respond as Hurricane Florence approaches. Guard officials said in a statement Thursday that soldiers, airmen and members of the Virginia Defense Force are staged around the state to support local and state emergency management officials. Potential missions include high water transportation, debris reduction, commodity distribution, shelter management assistance and search and rescue. Gov. Ralph Northam authorized up to 6,000 personnel for response operations and officials say they have been alerted and are on standby. Additional personnel will be on duty in Richmond and Fort Pickett to provide mission command, logistics, administrative and public information support. All commercial flights have been canceled at the Myrtle Beach International Airport as Hurricane Florence approaches the South Carolina coast. Airport spokesman Kirk Lovell said in an email that one flight left early Thursday morning and all other flights have been canceled for Thursday and Friday. He said 84 flights with 12,248 seats were on the schedule for Thursday, with 80 flights with 11,416 seats scheduled for Friday. Lovell said the airlines will decide when to resume service after Florence makes landfall. Myrtle Beach is served by 10 airlines. Hurricane Florence is still the most dangerous of the four tropical storms in the Atlantic. Forecasters at the National Hurricane Center say Tropical Storm Isaac was speeding into the eastern Caribbean Sea on Thursday after passing between Dominica and Martinique. The poorly organized storm with 45 mph (75 kph) winds was not expected to strengthen. Helene weakened to a tropical storm while moving north over the open Atlantic. Also over open waters, Subtropical Storm Joyce could transition into a tropical storm over the next couple days. Forecasters also were watching a tropical disturbance in the Gulf of Mexico. Gov. Roy Cooper is urging North Carolina residents not to ease up in their preparations for Hurricane Florence, despite southward changes in the storm’s forecast and a decrease in its top sustained wind speeds. The governor says the state “cannot underestimate this storm.” Forecasters are warning that Florence will bring surging ocean water, high winds and days of torrential rain. Cooper says there are currently about 108 shelters open in North Carolina with more than 7,000 people in them. He says emergency management officials plan to open even more. Emergency Management Director Mike Sprayberry says an estimated 750 people have packed a megashelter set up at a coliseum in Winston-Salem. Sprayberry says a team is conducting surveys to find other locations for potential megashelters. Hurricane Florence is slowing down as its outer bands of wind and rain lash North Carolina’s barrier islands. 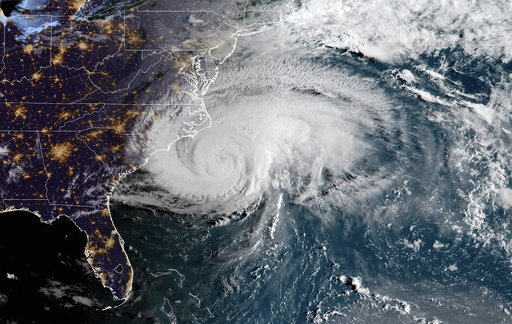 As of 11 a.m., the Category 2 storm was centered about 145 miles (230 kilometers) east-southeast of Wilmington, North Carolina, and about 195 miles (315 kilometers) east of Myrtle Beach, South Carolina. Its forward movement slowed to 10 mph (17 kph) and top sustained winds dropped slightly to 105 mph (165 kph). Still, National Hurricane Center Director Ken Graham says there is nothing “minor” about this hurricane. Water causes the most deaths during tropical storms and hurricanes, and Florence is expected to cause dangerous flooding. Graham said areas that repeatedly get hit even with weaker winds at Florence’s edges could see heavy rainfall for hours. Storm surge flooding also could push 2 miles (3 kilometers) or more inland if Florence lingers for days along the coast. Duke Energy Corp. is shutting down a coastal North Carolina nuclear power plant ahead of Hurricane Florence. The electricity provider says it began powering down one reactor early Thursday and would start shutting the second reactor later in the day. Florence was projected to reach land Friday near the plant located about five miles from the Atlantic Ocean near Southport. The Brunswick plant’s two reactors share the same design as those in Fukushima, Japan, that exploded and leaked radiation following a 2011 earthquake and tsunami. Federal regulators later required all U.S. nuclear plants be reinforced against earthquakes and flooding. Duke Energy did not provide information about specific changes made at Brunswick, other than to say emergency generators and pumps will remove stormwater if the plant floods. The long big slosh has begun. Meteorologists say the leading edge of Florence has arrived in North Carolina, with tropical storm-force winds carrying drenching bands of rainfall onto some beach communities. Florence will likely bring days of rain totaling three feet or more, and a storm surge of ocean water that rises to more than 12 feet near the center of the storm. Gov. Roy Cooper says he knows many people are watching the changing storm predictions and categories, and he’s concerned because some are even saying that “North Carolina is getting a break.” It’s not. Federal emergency officials at a Washington briefing are urging people to treat Hurricane Florence seriously even though its top sustained winds are down to 110 mph (177 kph), which makes it a Category 2 storm. They say it remains very large and very dangerous, bringing more than 30 inches of rain to the coast and heavy winds that will impact a giant swath of land. Federal Emergency Management Agency Administrator Brock Long says storm surge warnings have not changed despite the weakening intensity on the wind scale. He urged people in the coastal Carolinas and living near inland rivers to evacuate now. The police chief of a barrier island in the bull’s-eye of Hurricane Florence is warning any stragglers who refused to evacuate that they are making a dangerous choice. At a news conference just across the bridge in Wilmington, Wrightsville Beach Police Chief Dan House said a handful of residents on the island have refused evacuation orders. He’s telling them they “better go ahead and give me your next of kin” information, because no one will rescue them at the height of the storm. The police chief says he’s not going to put his people in harm’s way, especially for people they’ve already told to evacuate. The latest forecast shows the eye of Florence could pass directly over the barrier island, pushing a huge surge of ocean water. Forecasters at the National Hurricane Center warn that Florence remains deadly because of its size and slow forward speed, even if its top sustained winds have dropped it to Category 2 status as a hurricane. Director Ken Graham says there is nothing “minor” about this hurricane. Water causes the most deaths during tropical storms and hurricanes, and Florence expected to cause dangerous flooding. Graham said areas that repeatedly get hit even with weaker winds at Florence’s edges could see heavy rainfall for hours. Storm surge flooding also could push 2 miles or more inland if Florence lingers for days along the coast. Tornadoes also remain a threat, particularly in areas northeast of the hurricane’s eye. 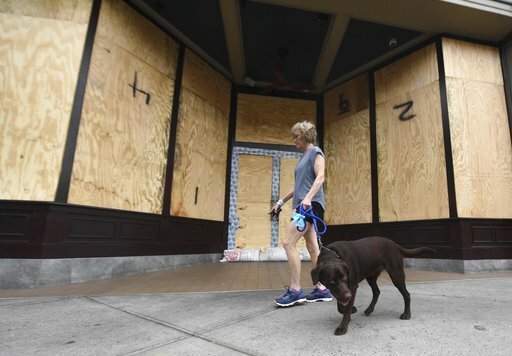 Senior hurricane specialist Stacy Stewart warns that Florence being a slow hurricane could mean three to four hours of battering, beach-eroding winds for some areas. The outer bands of wind and rain from Hurricane Florence are moving onshore along North Carolina’s barrier islands as the massive storm bears down on the Southeastern coastline. As of 8 a.m., the Category 2 storm was centered about 170 miles (275 kilometers) east-southeast of Wilmington, North Carolina, and about 220 miles (355 kilometers) east-southeast of Myrtle Beach, South Carolina. Its forward movement slowed to 12 mph (19 kph) and top sustained winds stayed at 110 mph (175 kph). Forecasters at the National Hurricane Center in Miami don’t expect it to strengthen from a Category 2 hurricane before it moves ashore, but they say the real problem will be water as Florence lingers along the coast through Saturday. The mayor of Myrtle Beach says her city has done as much as it can to prepare for Hurricane Florence. Brenda Bethune told NBC’s “Today” show Thursday morning that public safety crews have been checking to make sure businesses are secure, and looking for anything that could become a projectile as the winds come ashore. But the mayor says she knows many people are ignoring evacuation orders. She hopes they’ll stay inside once the winds, rain and floods arrive. She says people often want to get outside and take pictures. Bad idea, she says because emergency crews won’t be able to reach them in the storm. The Coast Guard says port operations in Charleston, South Carolina, have been stopped as Hurricane Florence approaches the coast. The Coast Guard said in a news release that the decision to stop port operations at 8 p.m. Wednesday comes because gale force winds of up to 54 mph (87 kph) were possible within 24 hours. 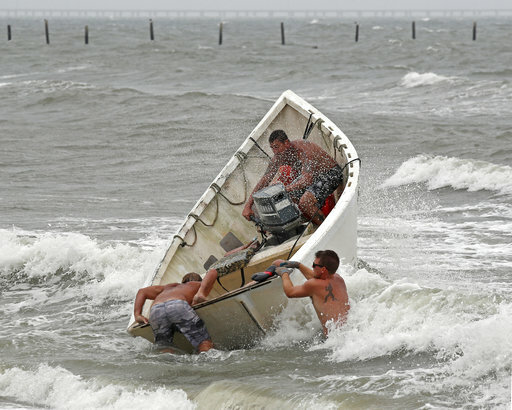 The Coast Guard said ocean-going vessels were told to prepare to leave. Those heading to Charleston were told to find another destination. The Coast Guard warned pleasure boaters to find safe harbors and noted that drawbridges might not operate once winds reach 25 mph (40 kph). The National Hurricane Center says the outer rain bands of Hurricane Florence are approaching the coast of North Carolina. Early Thursday the Category 2 was about 205 miles (325 kilometers) east southeast of Wilmington, North Carolina, and about 250 miles (405 kilometers) east southeast of Myrtle Beach, South Carolina. The gradually slowing but still life-threatening storm is moving northwest at 15 mph (24 kph). Little change in strength is expected before the center reaches the coast. Weakening is expected after the center moves inland. The Miami-based center says the center of Florence will approach the coasts of North and South Carolina later today. It then will move near or over the coast of southern North Carolina and eastern South Carolina in the hurricane warning area later Thursday and Friday.